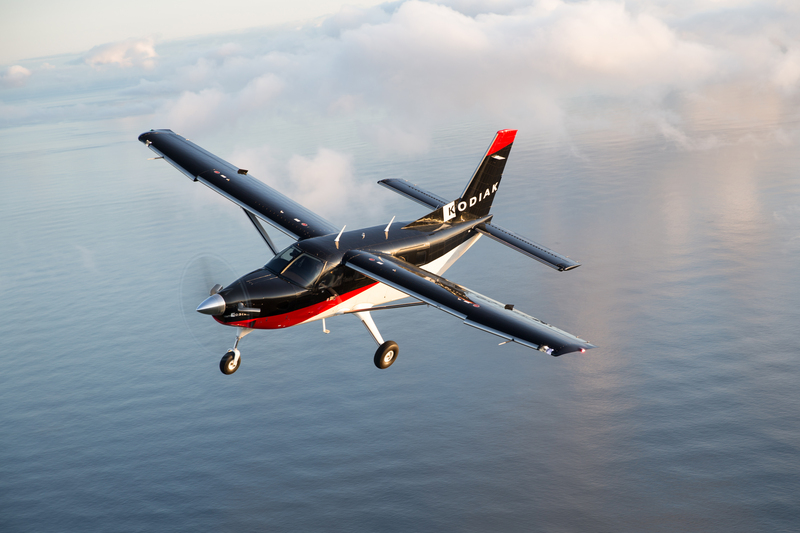 One decade after the first delivery of a Kodiak 100, Quest Aircraft is pleased to announce the next generation of the Kodiak 100: the Series II. The Kodiak 100, Series II by Quest introduces an impressive block change of enhancements. The standard equipment list has been expanded to include Garmin’s next generation G1000NXi, as well as an Angle-of-Attack indexer, digital 4-in-1 standby, Flight Stream 510 and a two-year subscription to the Kodiak Mobile App, backed by Garmin Pilot. The Series II also raises the bar for Kodiak creature comforts. In the cockpit Quest added two new gloveboxes for additional cockpit storage, improved Rosen sun visors for better UV protection and ergonomics, and incorporated LEMO plugs for hardwired Bose headsets. The cargo doorstep has been redesigned to reduce weight and improve functionality, and fuselage seals have been enhanced to provide even better soundproofing and cabin ventilation. Additionally, a single point refueling station is now an available as an option, designed to give the operator a simple, clean and easy way to refuel both wing tanks using a single port. “We’re incredibly proud to debut the Kodiak 100, Series II. The refinements and upgrades across the entire platform truly elevate the Kodiak experience, while continuing to deliver the distinctive design and workmanship we’re known for” said Rob Wells, CEO of Quest Aircraft. Prior to the release of the Kodiak 100, Series II, the Kodiak underwent considerable advances during the past decade, thanks to a consistent outflow of upgrades to each new model year. Over 200 enhancements have been incorporated into the Kodiak platform since its 2008 introduction, including the addition of two entirely new interiors, an increased landing weight, and the integration of the Garmin GFC 700 AFCS. “We dedicate an immense amount of time and resources into yearly model improvements, and we’re incredibly proud of what ten years’ worth of continual refinement has led to. With the announcement of the Series II we’re honoring that legacy of consistent improvement by introducing the largest and most significant block change in the Kodiak’s history,” Wells added. The Kodiak 100, Series II is available for order immediately, and customer deliveries are already underway. The newly certified aircraft will be on display at the Quest booth during EAA AirVenture in Oshkosh, Wisconsin. The 10-seat Quest Kodiak 100 combines superior STOL performance and high useful load. It offers proven turbine reliability with the Pratt & Whitney PT6 turbine engine and has the ability to land and take off from unimproved surfaces. The Kodiak can take off in under 1,000 feet at full gross takeoff weight of 7,255 lbs and climb at over 1,300 feet per minute. Originally designed to be the ultimate humanitarian workhouse, the unique combination of robust construction and remarkable payload capability has resulted in many additional applications for the Kodiak, including float (amphibious and straight) operations, special missions, medevac, skydive and more. The owner-flown segment continues to gain momentum as well, particularly in the North American marketplace. The Quest Aircraft Company is dedicated to providing access to more people and more places by building the most rugged, reliable, turbine STOL aircraft in the business. For the past decade, the 10-seat Kodiak 100 has proven its versatility in a wide range of public, private, business and humanitarian applications. Additionally, Quest’s continuously growing dealer and global support network provides customer assurance that their missions will be accomplished. The Kodiak is proudly built in Sandpoint Idaho, with a fleet of over 250 aircraft certified in over 55 countries around the globe. For additional information on Quest and the Kodiak, please visit questaircraft.com. © Quest Aircraft. All Rights Reserved. Site by Urban Influence.